Hi. New member. Own a very cared for 2004 boxster (always garage kept with cover). Only 47K miles--second owner. Recently noticed that an external part is missing, and having trouble identifying the part. Attached is the picture (if I attached correctly.) 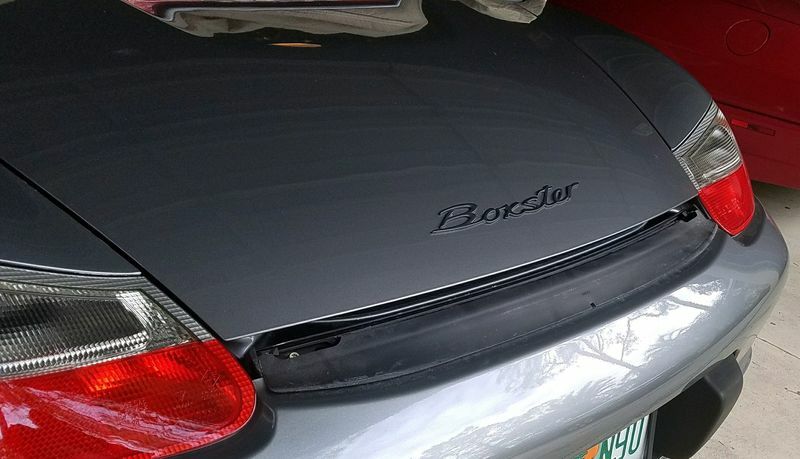 The part appears to be a flap between the rear trunk lid and bumper. Hoping to find a part number, and a place that can match the grey color. Any help would be appreciated. With part in hand, is this a DYI? [Also, forum is a great site for information. Go to the parts for sale part of this great forum and look for user 'itsnotanova'. Woody parts out Boxster's in TX and has a great reputation on this forum and other places for great service at very fair prices. Thanks. I appreciate your input, will follow up and let everyone know!